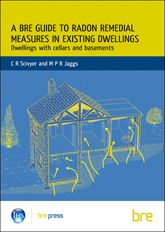 This manual is a practical guide to current good practice for the detailing and the construction of passive soil gas protective measures for new and existing residential development. The gases considered are principally methane, carbon dioxide and mixtures of the two. The sources of both gases are typically: fill or made ground containing biodegradable organic material; soils with a high organic content, eg peat; coal measures and/or underground mine workings; soil gas migrating from a nearby source. The details are also applicable to radon and, subject to the suitability of the materials, VOCs. 70 pages.